The DEWALT DWS779 compound miter saw is a personal choice because of its overall performance and cutting capacity. I also enjoyed the extra features that make it a great addition to my woodworking arsenal. I am interested in sharing the review I have created about this model so that you can also make a good choice in your purchase. What Makes a Good Compound Miter Saw? I love doing DIY projects at home. A reason for doing so is because I believe that it is cheaper that way, and that I am extremely interested in tinkering over little things that help me learn new skills. As such, I was searching for a tool that is not just for experts, but also easy enough to use for beginners like me. I came across the DEWALT DWS779 model, and was amazed at the potential of its features. I just wished that I had encountered this product earlier when I was looking for good choices under this category. It seems that this equipment is dependable enough for any cutting task. The DEWALT DWS779 compound miter saw is ideal for both professional woodworkers and carpenters, as well as beginners like me. It is very easy to use, with instructions that are easy to follow, adding to the overall convenience involved in completing a task. Another issue I initially need addressed is the capability of a compound miter saw to collect dust. The first tool I had was quite a failure in this regard. By using a compound miter saw that is equipped with excellent and dependable dust collecting feature such as the DWS779 from DEWALT, I no longer have to worry about dealing with dust while working on any type of material. Among the main benefits offered by a compound miter saw is ease of use. The miter saw is a power tool that can be used even by someone who has never used it before. There is no need for expertise when dealing with this tool, making it ideal if you are planning to work on some DIY projects. All you have to do is to follow the instructions in the manual, and be able to accurately use a compound miter saw. This type of saw is also famous because of the quality and smoothness of the cuts created. The type of material that you have to cut does not necessarily matter because it can cut through everything with great sleekness. Each type of stock is dealt with evenness and accuracy. Rough cuts and edges are not a problem with this type of saw. Precision and accuracy are two features that make the compound miter saw an ideal choice for carpenters and woodworkers. It is equipped with a locking feature in the angles, perfect when it comes to creating ideal angles. As such, there is no to worry about differences in the cutting angle. The size of the blade is one factor that needs to be given serious consideration. Among the most common sizes are 8, 10 as well as 12 inches. The bigger the diameter of the saw blade is, the better its capability to create longer cuts. This factor measures the actual power of the motor. The higher the amp, the more cutting capacity a miter saw has. 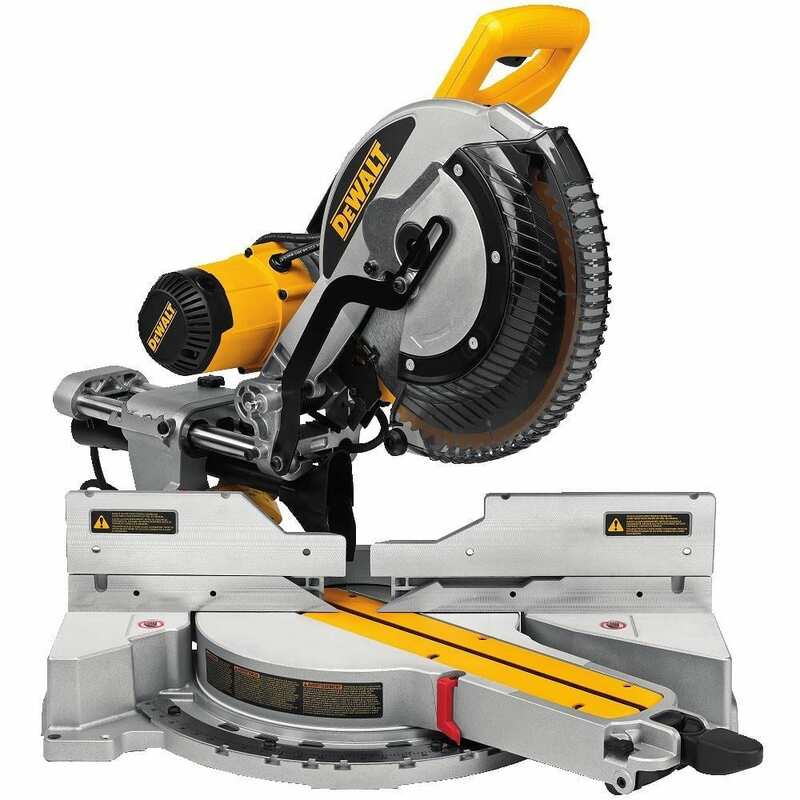 Most saws listed in this review come with 15 amp power, which is stronger compared to other models with just 10 or 12 amp capacities. Good quality models of miter saws are those that come with electric brakes. This feature works in reversing the flow of electricity within the motor the moment you release the trigger. By doing so, the momentum of the blade is stopped quickly. These electric brakes stops the blade in as fast as two seconds, which is faster compared to those without this feature. Other notable features that you may want to see in your miter saw include a blower and dust chutes. These features help in moving the sawdust away from the cutting area. Dust bags, on the other hand, can be directly mounted to the saw in order to collect sawdust. Advanced models may also come with digital displays, guide lights and laser guides which offers an easy to read display, as well as other setting information. The guide lights either cast a shadow or display a bean to the work piece, allowing you to be better guided in your cuts. The DEWALT DWS779 model is a 12-inch in diameter sliding compound miter saw. It is corded, offering precise, solid, and a powerful rotating speed that reaches up to 3,800 RPM. It has a 15 amp motor capacity which is designed to allow you to use this machine for a longer time, with enough power to finish the task. This unit is equipped with several features which make it a good option for any carpenter or woodworker who is looking for an ideal tool that can be added to his arsenal. It is a UL listed equipment that comes with a 3-year limited warranty, as well as a year of free service. The manufacturer of this model, DEWALT, also offers a 90-day return policy which is a guarantee of quality of this product. This system offers an adjustment-free cutting line indicator which improves visibility and accuracy while cutting. It also comes with dual horizontal rails made of steel, accompanied with an innovative clamping mechanism as well as linear ball bearings that offer durability, accuracy and compact cutting capacity. This miter saw is equipped with an exclusive back fence design which has the capacity to cut up to a 2 x 16 dimensional lumber (90 degrees), as well as 2 x 12 (45 degrees). It can miter 60 degrees (right) and 50 degrees (left), offering capability ideal for professional types of applications. There is no need to worry about dust collection using this model because it features a system that can collect over ¾ of the dust, which is good enough for a built-in system. The 15-amp motor rating and up to 3,800 RPM rotating speed is designed to last for a long time. This model is equipped with a dependable dust collection feature. The miter can be adjusted accordingly in order to ensure precision in cutting. Equipped with a 90-day return policy, and a 3-year limited warranty. The belt drive has the tendency ot kick on start up. The dust collector comes with a rubber funnel, which may collapse and block the dust hole. One customer said that this is a “great saw” for a “great price”. He used it for finishing trims and cabinetry, enjoying the length and depth of cut that this saw makes. Another customer also praised the “smooth cut” that this saw is capable of providing. He used it for crown molding, as well as in building bookshelves. He paired this saw with a diablo blade and experienced maximum capacity in cutting. One customer, however, expressed concern over the quality of this product. For example, he noticed that the belt drive has a tendency to kick in during initial startup. This means that this model misses the slow start feature which could have solved the problem. While he was contemplating keeping the saw or not, the sliding feature still makes it a suitable option for him. The Hitachi C10FCE2 miter saw is one of the lightest models there is. As a matter of fact, it only weighs about 26 pounds. As such, it is very easy to lift and complete those vertical cuts. Transferring this saw from one place to another is also quite easy since it comes with a built-in handle. Aside from being a compact unit, it is also equipped with enough power which offers a speed of 5,000 RPM. This power translates to more efficient and faster cuts which leaves smooth edges on floorings, the hardwood, as well as aluminum. Among the standout features of this model is its smooth pivoting action, as well as its anti-kickback function which decreases vibration while ensuring a quiet start-up. The Makita LS1016L dual slide compound miter saw is a 10-inch dual bevel slider that comes with enhancements compared to its previous model. It comes with an improved capacity to deal with crown moldings, thus resulting to praises from several users. This saw is portable, and comes with a huge ergonomic rubberized and horizontal D-handle style base handle. It has an amazing soft start, giving this saw the image of a professional grade tool. It also has precision adjustments which is made possible with the use of dual front bevel scales for enhanced visibility. This miter saw also operates quietly because the manufacturer has embedded it with a sealed gearbox that is used in transferring power directly to the blade, rather than the belt. The DEWALT DWS709 compound miter saw is the ideal option for individuals who are interested in seeing accuracy, power and versatility. It has the capacity to miter up to 60 degrees going to the right, as well as 50 degrees to the left. As a product under the DEWALT brand, this model offers dependability in terms of quality. It has a powerful 15 amp motor rating, offering 3,800 RPM speed, thus offering extended durability and power. It is also designed with an oversized bevel scale which makes angle adjustments easy and accurate. With a weight of 51 pounds, it is lightweight and compact, thus allowing for easier storage and transport. Its precision and machine base fence support maximizes cutting accuracy and durability. The DEWALT DW715 has become a model of choice for many because of its power and portability. It also does a great job in cutting, with an adjustable and precise cam lock miter system which enables cutting angles with accuracy. In fact, this is one of the strongest selling points of this model, allowing you to create accurate bevel cuts up to 48 degrees going to the left, as well as 3 degrees to the right. This capacity makes it capable of dealing with bigger jobs with extreme versatility. Among the features we love about this model is that it comes with an arm that swings easily from a side to the other, ensuring accuracy in the bevel angles from both sides. This model gets all the needed power from its 15-amp motor, spinning the blade up to 4,000 RPM. As such, you can expect to achieve accurate angles more efficiently and faster. The DEWALT DWS780 double bevel sliding miter saw makes work faster. Its sliding mechanism also increases further the cutting width, when compared to using non-sliding saws. As a double bevel model, it has the capacity to tilt to the left or right, making it easier to deal with cutting complex angles, such as when working on tapered boxes and crown molding. It is also designed with a 45 degree override, allowing you to adjust the angle of the bevel slightly past the value in any direction. This model also comes with a handle located at the upper part of the saw, as well as two hand grooves at each side, making it very portable. A compound miter saw is indeed, a valuable tool that can be added to a woodworker, or carpenter’s arsenal. Its features, such as the capacity to offer better versatility makes it an ideal option. Overall, the DEWALT DWS779 12" Sliding Compound Miter Saw is a very promising choice. Among the features we admire in this product is the use of a cutline blade positioning system which allows you to expect accuracy every time. It even comes with an excellent dust collection feature that can capture up to 75% of generated dust. I recommend using the DeWalt DWS779 for your next project and to save you money, you can find the lowest price online.